The duo expands to a quartet on some tracks with guests saxophonist Tim Ries (a member of the Maria Schneider Orchestra) and percussionist Jeff Ballard (Chick Corea's drummer) on tastefully-chosen hand percussion. From the sumptuous title track (by Maria Schneider) through originals ranging from shimmering and glimmering to gently world beat to cordially funky, this is deliciously rich and beautiful music that both sophisticated listener and good music lover will enjoy time and again. 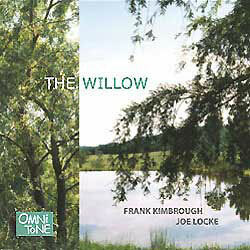 Frank Kimbrough's compositions published by Kimbrough Music/BMI. Joe Locke's compositions published by Wire Walker Music/BMI. Recorded (24-bit) 3-4 December 2000 at Systems II Studios, Brooklyn NY.